The lotus eater is a Charming self contained balinese style bungalow set out in an open plan studio style, sleeping 2 adults in a queen size bed. 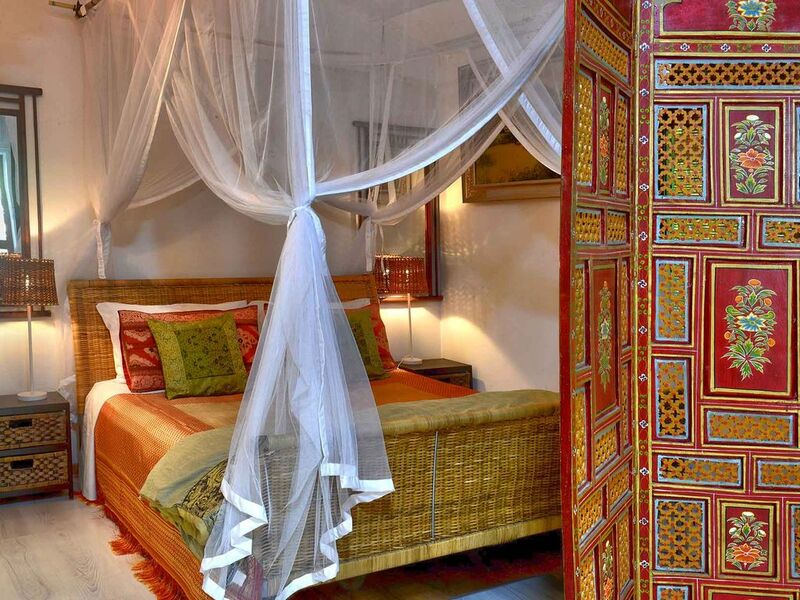 Stylishly decorated with authentic indonesian furniture and artworks. The bungalow is nestled in a lush tropical garden setting, so wake up to the birds, not traffic noise. The lotuseater is fully self contained and detached, located in the garden behind the owners home so privacy and security is ensured. There is no sharing of spaces, you have the entire bungalow with its own front verandah and rear courtyard for your own private use. Comfortable Queen size made up with hotel quality bed linen topped with romantic netting and sandstone ensuite bathroom with shower and vanity unit. Front verandah with outdoor furniture to relax on and take in the garden views while you read a book or have a glass of wine. At the rear of the bungalow there is a sunny courtyard with table and chairs where you can enjoy alfresco meals or just relax. Walk to the city or the fashionable shopping and cafe strip of unley rd and king william rd. with their eclectic mix of cafes,art, fashion and homewares. Loads of Cafes just around the corner to suit any taste or budget. Public transport is just a few minutes walk around the corner on Unley road and the Glenelg to City tram is a 10 minute walk away or walk across the park to the CBD. Located in the historic and cool inner city suburb of Parkside. Minutes from the centre of Adelaide's attractions of galleries, festival centre, shopping, restaurants and nightlife. Walk around the leafy and historic suburbs of unley and parkside with beautiful examples of adelaide sandstone and bluestone architecture. Walking distance to the Clipsal racetrack. 20 minutes to adelaides sandy beaches. 15 minutes to the beautiful adelaide hills and the many attractions. 1 hour from the wine producing districts of Maclaren vale and the Barossa valley. 5 minutes walk around the corner to the cafe and pub precinct of unley road with a variety for all tastes and budgets. Adelaide parklands just at the end of the street for you to enjoy a walk or jog without being bothered by traffic. Supermarkets, shops and all amenities close by. Public transport just around the corner. Please Like thelotuseateradelaide on Facebook!! Long weekends are a 3 night minimum stay. Shorter stays accepted in these time if there a gaps between other bookings, so please enquire using other calendar dates so the enquiry can go through. Long stays are negotiable depending on season and length of stay so please contact owner for a quote. An on street parking permit is available to guests with a $50 deposit refunded on return of permit. So please let me know when booking if you require this. This property is ideally located close to Adelaide without the hustle and bustle. Communication from Angela was first rate. The bungalow was clean and tidy and very comfortable. Good amenities. Very authentic Balinese accommodation in a charming neighbourhood. Nice and close to food outlets for walking to our nightly dinners. Although I didn't meet Angela, she was very prompt and helpful when communicating by email and phone. We had a lovely stay during very hot weather. Lovely place with a comfy bed and everything was as described. we had a fantastic stay at the Lotus Eater. It has everything we needed to have a relaxing stay. One small suggestion is to have bigger wine glasses but that was fairly incidental in the scheme of the whole place. Everything you could need to make an enjoyable stay. Really comfort able bed and charming outside area to sit.